Q: The UN Security Council adopted its latest resolution on sanctions against the DPRK. The DPRK Foreign Ministry said that it is "an act of war" and those countries that voted in favor of this resolution shall be held completely responsible for all the consequences to be caused by it. What is your comment? A: The United Nations Security Council unanimously adopted Resolution 2397 on December 23 in response to the DPRK's intercontinental ballistic missile launch on November, to which we gave a response on Saturday. I would like to repeat that the new resolution, while moderately tightens sanctions against the DPRK, also stresses that the resolution is not intended to have adverse humanitarian consequences for the civilian population of the DPRK, or to affect negatively those activities, including economic activities and cooperation, food aid and humanitarian assistance that are not prohibited by relevant resolutions, or impede the activities of diplomatic or consular missions of the DPRK pursuant to the Vienna Conventions on Diplomatic and Consular Relations. The resolution also reiterates its commitment to peace and stability on the Korean Peninsula and in Northeast Asia, calls for a peaceful, diplomatic and political solution to the issue, supports the resumption of the Six-Party Talks, and calls on relevant stakeholders to undertake measures to reduce tensions on the Peninsula. 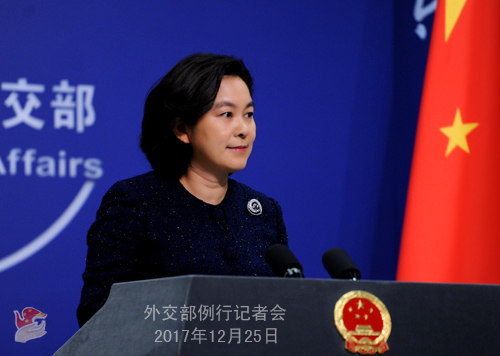 China hopes that all relevant parties could implement the DPRK-related resolutions adopted by the UN Security Council including Resolution 2397 in a comprehensive and balanced manner. 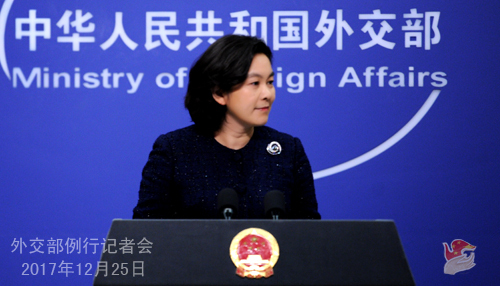 Under the current circumstance, China calls on relevant countries to exercise restraint and make positive and constructive contributions to alleviating tension on the Peninsula and properly resolving the Korean Peninsula issue. Q: The 3rd symposium for Palestinian and Israeli peace advocates was held last week in Beijing where some in-depth discussions were made among the attendees on the Palestine-Israel issue and a range of agreements were also reached. Could you offer more details? How does China perceive its role in the Palestine-Israel peace process against the backdrop of stalled peace talks and renewed turmoil surrounding the status of Jerusalem? 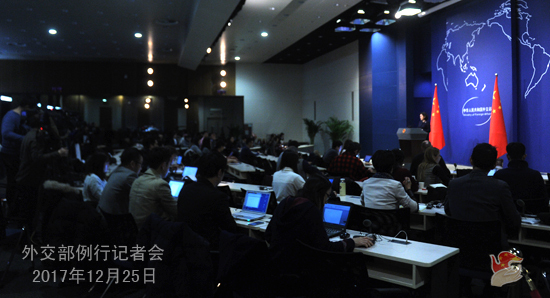 A: From December 21 to 22, China hosted the 3rd symposium for Palestinian and Israeli peace advocates in Beijing. Peace advocates, eight from each side, held thorough and in-depth discussions on the basis of seeking common ground while shelving differences in the shared pursuit of peace surrounding three topics, namely measures to be taken by leaders of both sides, roles to be played by civil societies of both sides, and contributions to be made by the international community. A consensus document on promoting the settlement of the Palestine-Israel conflict based on the two-state solution was reached, reaffirming the two-state solution as the only viable way in resolving the Palestine-Israel issue. We believe that the consensus reached at this symposium, reflective of the sensible voices of the two nations, pooled together commitments to peace and this symposium was very timely and consequential in face of the new changes in the Middle East. China firmly supports the just cause of the Palestinian people to restore their legitimate national rights, the two-state solution, and the establishment of an independent Palestinian state of full sovereignty with East Jerusalem as its capital along the 1967 border. China believes that only when a Palestinian state is established in real sense can Israel achieve enduring security, and only when the Palestinian-Israeli issue is settled in a comprehensive manner can the situation in the Middle East be fundamentally alleviated. We maintain that the status of Jerusalem shall be resolved through negotiations on the final status of the city in accordance with the basic consensus reached by the international community over the years. Days ago, the UN General Assembly overwhelmingly passed a resolution, affirming that any decisions and actions which purport to have altered the status of Jerusalem are null and void, and the international community will act in line with the UN resolutions and the international consensus. China maintains that the principles of historical diversity, justice and fairness, international consensus and peaceful co-existence shall be upheld so as to arrive at a solution through the final status negotiations that conforms with relevant UN resolutions and takes into account the interests of all parties. Palestine and Israel shall respect each other's right to existence and more importantly, refrain from making any moves that may further worsen the situation. As a permanent member of the UN Security Council, a responsible major country and a friend to both Palestine and Israel, China has been actively promoting the Middle East peace process and peace talks to that end as a staunch supporter for peace. Guided by the four-point proposal raised by President Xi Jinping, China will continue to seek a comprehensive, fair and enduring solution to the Palestine-Israel issue at an early date and bring about peace in the Middle East. Q: According to reports, on December 21, a Taiwan official addressed the United Nations Internet Governance Forum (IGF) by video conferencing, which triggered protests from the representative of the Chinese mainland. What's your comment on this? A: Our position is consistent and clear. The Taiwan region's participation in the activities of international organizations must abide by the one-China principle. The United Nations Internet Governance Forum is a mechanism for discussing internet governance under the UN framework. The Forum's Secretariat strictly follows the UN General Assembly's Resolution 2758 and observes the one-China principle. I shall also point out that any attempt to seek Taiwan independence on the international stage will end in nothing but failure. Q: According to Taiwan media, the Swedish Foreign Minister said when answering inquiries at the Riksdag that she is supportive of Taiwan's meaningful participation as a non-state actor in international organizations and is willing to continuously endorse Taiwan's attendance at expert meetings in the fields such as aviation security. On Taiwan's participation in the World Health Organization (WHO), she said that she is positive towards Taiwan's aspiration to become an observer, but this issue still demands consensus within the WHO, consensus that is absent at the moment. What is your comment? A: I believe that when answering the question from the Taiwan "Central News Agency" just now, I have made our position clear on the issue of this sort. With regard to the participation of Taiwan as a region of China in the activities of international organizations, China's position on adhering to the one-China principle is consistent and clear. The Taiwan question belongs to China's internal affairs, and China firmly opposes other country in making irresponsible remarks in that regard. Before we wrap up today's press conference, I have some sad news to tell you. You may have learned that Mr. Ezzat Shahrour, the Beijing Bureau Chief for Al Jazeera Arabic, passed away on December 23 in Beijing due to illness. Mr. Ezzat Shahrour, who spent more than 20 years living and working in China, made positive contributions to helping people across the Arab world to better understand China and promoting China-Arab friendship. We express our deep sadness and grief over the passing of Mr. Ezzat Shahrour and sincere condolence to his family and relatives. The relevant Chinese department stands ready to help his family at this difficult time.